Our diamonds are accompanied by diamond grading reports from leading independent gemological laboratories worldwide. 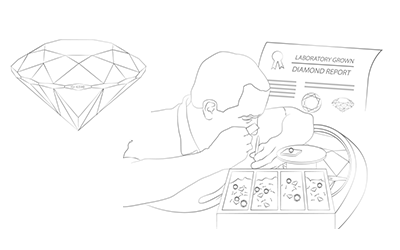 These certificates are issued to guarantee a diamond’s legitimacy, whether mined or cultured (laboratory grown). Our certified cultured diamonds are also laser inscribed to authenticate its point of origin. A unique certificate number is indicated on the girdle.